Check TS Constable PET PMT schedule 2016. This year Telangana has released 8691 vacancies for the post of constable for 9281 posts. So many candidates who are looking for Telangana jobs had applied for this post. Now it is going to conduct the physical test for applied candidates, for that they had released Telangana Police physical test dates. Aspirants who had applied for the exam can check this TS constable events schedule. Candidates can also download their Telangana Constable PET call letter 2016 from official website www.tslprb.in. For more information about TS police SI PST PET Dates read full article. Police Constable PET/PMT will be held from 15th July 2016 and call letters will be available from 09 July 2016 2.00PM..
Telangana police are one of the efficient organizations in India. After dividing with AP, they had formed separate departments in every sector, in the same way, they formed Telangana police organization, it is successfully doing their duties. They are doing much hard work for their state development. To run an organization successfully, they need efficient employees. So for that, they are releasing recruitments. TS govt announces that still they will release more recruitment in future. In the coming years, the state needs more employees in the police department. In the same way, they change the selection process and make it the little bit difficult to recruit efficient applicants. At present selection process of the exam is the physical test, written test, in future they can make some changes in the pattern. TS Constable PET PMT schedule 2016 is released. They will conduct first physical measurement test, in that male candidates who had more than 167 cm and women more than 157 cm will qualify in the PMT. Then they will conduct physical efficiency test, in that they will conduct some events like race in 800 meters, 1000 meters, shot put, high jump, long jump. After conducting this tests then they will announce the results. Recently only they had conducted a preliminary examination, candidates who had selected in the exam their names are given in the PET exam. For them, they are conducting the exam. 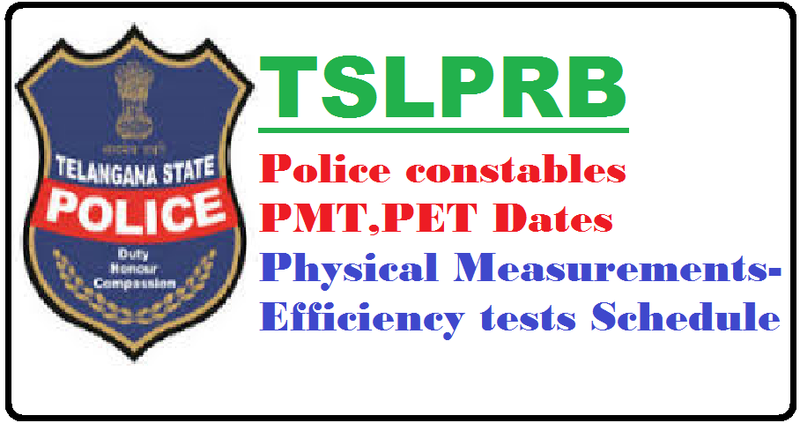 Please check the TS Constable PET PMT schedule 2016 and attend according to the exam. Applicants who had applied for SI posts can attend for the PST test in June, for constable they will soon announce the dates. For more details about Telangana Constable PET call letter 2016 please visit official website www.tslprb.in. Here we had given more information about TS Constable PET PMT schedule 2016, check it. Candidates who are looking for latest police jobs had applied for this recruitment. Actually, this recruitment is released for 9281 vacancies for constable in the departments of Civil, AR, SAR CPL, TSSP, special protection force, disaster, and fire department. So many applicants had applied for the exam. They had conducted preliminary written exam and released the details of shortlisted candidates. Now it is releasing TS Constable PET PMT schedule 2016. Applicants who had applied for the exam can download this TS constable events schedule. Candidates can also download Telangana Constable PET call letter 2016. In that hall ticket, they will give the details of physical efficiency test and physical measurement test. Please check the TS police SI PST PET Dates clearly and attend at particular time.